In the same location since 1895, Ghirardelli's flagship store is not to be missed; and is especially beautiful at night. 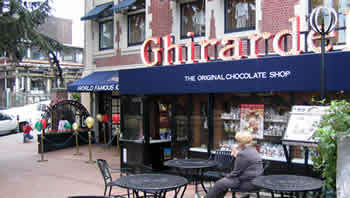 Ghirardelli Square was declared an official city landmark in 1965 and has been granted National Historic Register status. In addition to the soda fountain, Ghirardelli Square contains a variety restaurants and shops and is a popular stop for San Francisco visitors. It is located at the westernmost end of Fisherman's Wharf one block west of the Powell-Hyde Cable Car turnaround. An old fashioned style soda fountain featuring chocolate making machinery, in operation, just a steps from your table. Indulge in Ghirardelli's World Famous Hot Fudge Sundae or any of its ice cream sundae creations, shakes, floats and malts. Don't miss the chocolate shop, with an amazing array of chocolate treats to eat now or have shipped home. Open Daily: 10 am to 11 pm. The soda fountain is at street level on the Larkin Street side of Ghirardelli Square. It is wheelchair and stroller accessible, although the seating is crowded and aisle ways narrow. Restrooms are elsewhere in the Ghirardelli Square shopping center and may be reached via stairs or elevator. Of all their fabulous creations, we love the hot fudge sundae. Their fudge is the best and we strongly recommend ordering extra fudge. Finding a table at peak hours is like finding a parking space at the mall before Christmas. Check out the building at night, when all the lights are lit. Check out the chocolate shop, and bring your address book, because chocolate makes a great treat to ship to friends and family. Get your parking validated when you order. Take Columbus Avenue northwest toward Fisherman's Wharf and Turn left on North Point Street. Look for street parking or proceed to Larkin, turn right and then left into the underground parking structure.